Magnesium is a component of several primary and secondary minerals in the soil, which are essentially insoluble, for agricultural considerations. These materials are the original sources of the soluble or available forms of Mg. Magnesium is also present in relatively soluble forms, and is found in ionic form (Mg++) adhered to the soil colloidal complex. The ionic form is considered to be available to crops. Photosynthesis: Mg is the central element of the chlorophyll molecule. Soil Mg:Mn ratio: High available Mn can directly reduce Mg uptake. This may be independent of the acid conditions normally associated with excess available Mn in the soil. Soil CEC: Low CEC soils hold less Mg, while high CEC soils can hold abundant Mg. However, if a high CEC soil does not happen to have strong levels of Mg, it will tend to release less of the Mg that it holds to the crop. High cation applications: High application rates of other cations, especially K, can reduce the uptake of Mg. This is most common on grasses, and corn seems to be the most sensitive grass. Other cations: Being a major cation, Mg availability is related to the soil CEC, and it is in competition with other major cations such as calcium (Ca++), potassium (K+), sodium (Na+), ammonium (NH4+), iron (Fe++), and aluminum (Al+++). It appears that potassium is a stronger competitor with Mg than it is sometimes considered to be. We have frequently seen that whenever the soil K level is higher than desired, or when the soil K:Mg ratio (in lb./acre) is above 1.5:1 (or the soil Mg:K ratio is less than 0.67), plant Mg levels are reduced. This effect occurs sooner and more severe in grasses, especially corn, than in other crops. It may seem inconsistant to list a specific numerical K:Mg ratio, when we earlier stated that specific numerical ratios are not valid. However, we are simply stating that Mg problems are more frequent or severe when the soil K:Mg ratio exceeds 1.5. We are not claiming that there is an ideal K:Mg ratio. Phosphorus: Phosphorus uptake is often enhanced when applied with Mg fertilizers. However, mixing some liquid or suspension sources of P and Mg can lead to a reaction can result in the formation of a large amount of precipitated material, to the point of near solidification of the mixture. For many years, there have been a few people who claim that there is an "Ideal" ratio of the three principal soil cation nutrients (K, Ca, and Mg). This concept probably originated from New Jersey work by Bear in 1945 that projected an ideal soil as one that had the following saturations of exchangeable cations 65% Ca, 10% Mg, 5% K, and 20% H. The cation ratios resulting from these idealizes concentrations are a Ca:Mg of 6.5:1, Ca:K of 13:1, and Mg:K of 2:1. It is generally accepted that there are some preferred general relationships and balances between soil nutrients. There is also a significant amount of work indicating that excesses and shortages of some nutrients will affect the uptake of other nutrients (see later sections of this paper). However, no reliable research has indicated that there is any particular soil ratio of nutrients. Over the years, a significant amount of conversation and salesmanship has revolved around the concept of the ideal soil Ca:Mg ratio. Most of the claims for the ideal ratio range between 5:1 and 8:1. Reduce weed populations, especially foxtail and quackgrass, and improves forage quality. Reduce leaching of other plant nutrients. Generally improve the balance of most soil nutrients. According to Dr. Stanley Barber, Purdue Univ., "There is no research justification for the added expense of obtaining a definite Ca:Mg ratio in the soilResearch indicates that plant yield or quality is not appreciably affected over a wide range of Ca:Mg ratios in the soil." Wisconsin research found that yields of corn and alfalfa were not significantly affected by Ca:Mg ratios ranging from 2.28:1 to 8.44:1in all cases, when neither nutrient was deficient, the crops internal Ca:Mg ratio was maintained within a relatively narrow range consistent with the needs of the plant. These findings are supported by most other authorities. A soil with the previously listed ratios would most likely be fertile. However, this does not mean that a fertile soil requires these specific values (or any other). Adequate crop nutrition is dependent on many factors other than a specific ratio of nutrients. It will rarely be profitable to spend significant amounts of fertilizer dollars to achieve a specific soil nutrient ratio. In later sections of this paper, you will find references to nutrient ratios. However, in most cases there will not be specific numerical ratios associated with these relationships. The intention is to indicate that as the relative abundance of the nutrients changes significantly, it could affect the availability of the other nutrient. This concept is much less specific than claiming that there is a value to a specific numerical ratio. While this is an essential element for all plants, these crops have been found to be especially responsive: alfalfa, blueberry, beet, broccoli, cabbage, cauliflower, celery, clover, conifers, corn, cotton, cucumber, eggplant, lettuce, onion, pepper, potatoes, pumpkin, spinach, squash, tobacco, tomato, and watermelon. The classic deficiency symptom is interveinal chlorosis of the lower/older leaves. However, the first symptom is generally a more pale green color that may be more pronounced in the lower/older leaves. In some plants, the leaf margins will curve upward or turn a red-brown to purple in color. Full season symptoms include preharvest leaf drop, weakened stalks, and long branched roots. Conifers will exhibit yellowing of the older needles, and in the new growth the lower needles will go yellow before the tip needles. Magnesium toxicity's are rare. 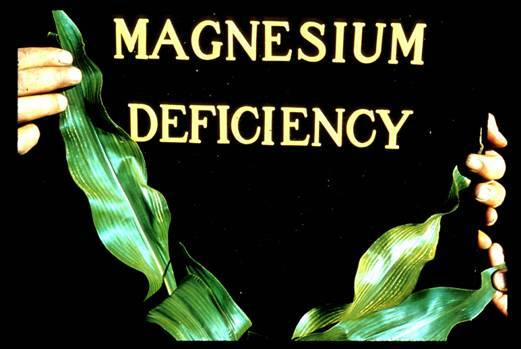 Crops grown on heavy Montmorillonite clay soils that have been poorly fertilized with potassium may exhibit excesses of Magnesium in their tissue. But, before the tissue level approaches toxicity, Potassium deficiency will occur. Higher tissue levels of Magnesium are usually found in the older leaves on the plant and may be associated with diseased or damaged leaves. High soil K:Mg ratios (lb./acre). Ratios greater than 1.5:1 are a serious risk in most forages, but corn silage or green chop would be a concern on a soil with a K:Mg ratio of 1:1, or higher, especially if other negative factors exist. Soil testing is the first step in determining a need. If the analysis shows a need and a supplemental application is indicated, you can be confident the application will be economically sound. As always Plant Analyses are also useful in uncovering "hidden" Magnesium shortages and when a need is determined, treatment should follow. Magnesium is a constituent of most agricultural lime, as well as specific Mg fertilizers. Magnesium containing materials applied to the soil may serve two functions. Correcting problems is often difficult. Proper liming with dolomitic limestone is almost always the most practical solution to low Mg, even if the dolomite is more expensive. Supplemental broadcast and row applications will most likely need to be repeated over a period of several years. If row applied fertilizers are used where magnesium shortage is a problem, it is desirable to minimize in-row K applications to avoid K-Mg competition. However, materials such as Sul-Po-Mag and K-Mag that contain both nutrients have been used to partially satisfy Mg needs on soils where the crops had significant Mg stress caused by extremely high K levels. Likewise, broadcast recommendations of K20 equal to, or in excess of 400 lb/A should be split into two or more applications. Good responses have been obtained from foliar applications of both Epsom salts (MgSO4) and Magnesium chelates. The basic consideration with these materials is total cost per acre. Also remember, foliar applications are only supplements to a sound soil fertility plan. They are rarely successful in replacing a sound soil fertility program where soil Mg levels are weak. * Please note that while oxide forms of nutrients appear to be a much better value, they normally have very low solubility, thus low availability to plants in the year of application. They may have beneficial uses where availability in future seasons is the goal.